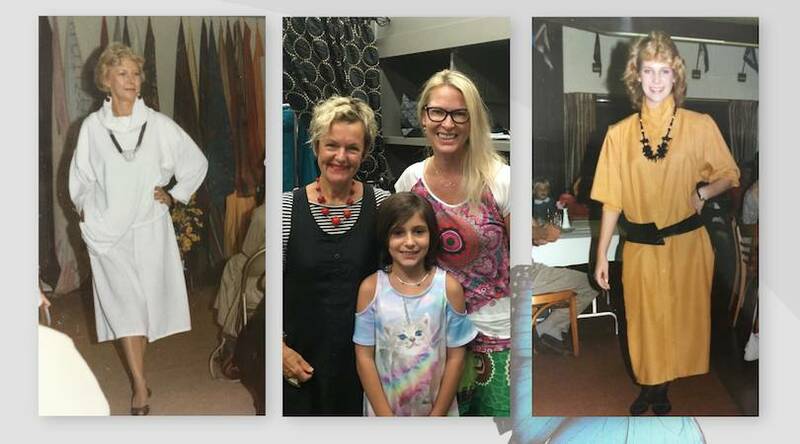 Once upon a time in the 1980s, our very own Lous had a clothing label that predated the line here at the boutique. It was called “Pierrot Designs,” and although the decade was different, the design philosophy then was much the same as the clothes we make here at Lousje & Bean now: elegant, well-constructed pieces that flatter without compromising on comfort. Lous had a storefront for Pierrot in Port Dalhousie where she designed and sold her pieces; it was a lot like what we do today, only on a bit smaller scale. Recently, we came across a treasure trove of photos from that time, and we’re thrilled to share them with you today. Looking at the photos, you can see Lous’ signature in them even then! Her look is so timeless. You can even see a young Tessa (AKA “Bean”) in the background of the photos. Too cute! Funnily enough, one of the models from a Pierrot Designs fashion show came into the store to say hello the other day. She doesn’t live in the area, but when she was visiting she said she had to stop in and say hello to Lous. It was such a treat to hear her stories! Her name is Julianna, and she told us how she never forgot Lous’ unique clothes and great style, and she was so delighted to hear that Lous was still working in fashion. We loved connecting with her, and she even picked up one of our awesome Bubble Coats to take home. Talk about an awesome souvenir. We absolutely loved connecting with her, and it was such a blast from the past to revisit the photos from that time. Though Pierrot Designs is now closed, it’s wonderful and wild to see that, no matter how much things change, much of the past remains with us. Julianna, we loved seeing you, and we hope to see you again soon! Thank you for your kind words Julianna. Looking forward to seeing you again! I fondly remember those days and loved your designs!